Italian Vania Rossi, the former girlfriend of Riccardo Riccò, could be back to racing in the near future. She tested positive for the third generation form of EPO, CERA, at a control taken following her second place finish in the National Cyclo-cross Championships on January 20th. Rossi's B-sample subsequently yielded a "non-positive" result, marking the first time that a second test for CERA did not confirm the initial findings. In both cases the analytical results of the tests were confirmed, as per WADA regulations, by the laboratory of Chatenay-Malabry, France. "The minimum levels have not been found [in the B-Sample] that are required to meet the criteria for the World Anti-Doping Agency (WADA)," the Italian Olympic Committee said at the beginning of April, according to Tuttobiciweb. Francesco Botrè, the director of the anti-doping laboratory in Rome, told La Gazzetta dello Sport, "This does not mean that the B sample that was recently tested did not have the substance present, indeed. 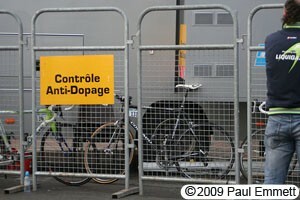 Only that the amount was not sufficient to meet the minimum standards required by the World Anti-Doping Agency." The case was then handed over to the Italian Olympic Committee's Anti-Doping prosecutor, Ettore Torri, who recently met with Rossi's lawyer. "We had a long conversation with Ettore Torri, CONI's Chief Anti-Doping prosecutor," explained her attorney Fiorenzo Alessi to La Repubblica. "The results are positive: her suspension was immediately withdrawn. Now everything will go to the Court to make it official, but from what we understand it's over." According to Tuttobiciweb, Torri wants to clarify the reason for a positive and negative result. "We hope that this nightmare ends soon," Rossi told Tuttobiciweb. "Today I'm in much higher spirits since it will show that I am clean and that I haven't tried to cheat anybody. Now I expect some of the people that attacked me in the newspapers to apologize."